Proper variety selection is one of the first steps in producing a high-yielding, healthy crop. Choosing an appropriate variety is one of the most important decisions a soybean producer will make and one of the hardest because there are so many varieties available. Each variety has specific strengths and weaknesses that make it more- or less-suited for a given environment. Last week we introduced our Variety Selector Database Tool. This tool is a great resource for helping you with selecting the best varieties for each farm. To learn more about the tool, visit this post. This week we will look at some of the important selection criteria for choosing the right variety. Maturity group, yield potential, disease tolerance, and herbicide technology are all important to consider. One of the first steps in variety selection is to choose your relative maturity. Even if you plan to plant a range of maturities, focus on one relative maturity at a time to help reduce the list of options. Understanding and selecting the appropriate maturity for a given area is critical to maximizing soybean yield. A variety is classified based on the geographical range where it utilizes the available growing season but still reaches physiological maturity before the first frost. We recommended selecting a variety that maximizes growth prior to entering reproductive stages but still flowers early enough to reach physiological maturity before the first killing frost. The next step in choosing a variety is to select the herbicide tolerance trait(s) you plan to use. The majority of soybeans grown in the United States contain at least one genetically-engineered herbicide tolerance trait. Herbicide tolerant classes include Roundup Ready (RR), Roundup Ready 2 Yield (RR2), Liberty Link (LL), sulfonylurea-tolerant soybeans (STS), Xtend, and 2,4-D (Table 4-1). The RR, RR2, LL, Xtend, and 2,4-D traits are genetically modified, while the STS trait was developed using conventional methods and is not considered genetically modified. Tolerance or resistance to disease is another important factor to consider when selecting a soybean variety. Genetic resistance is probably the most cost-effective way to manage disease. A wide range of environmental conditions occur across the state of North Carolina during the growing season, and these conditions often influence the occurrence and severity of soybean diseases. 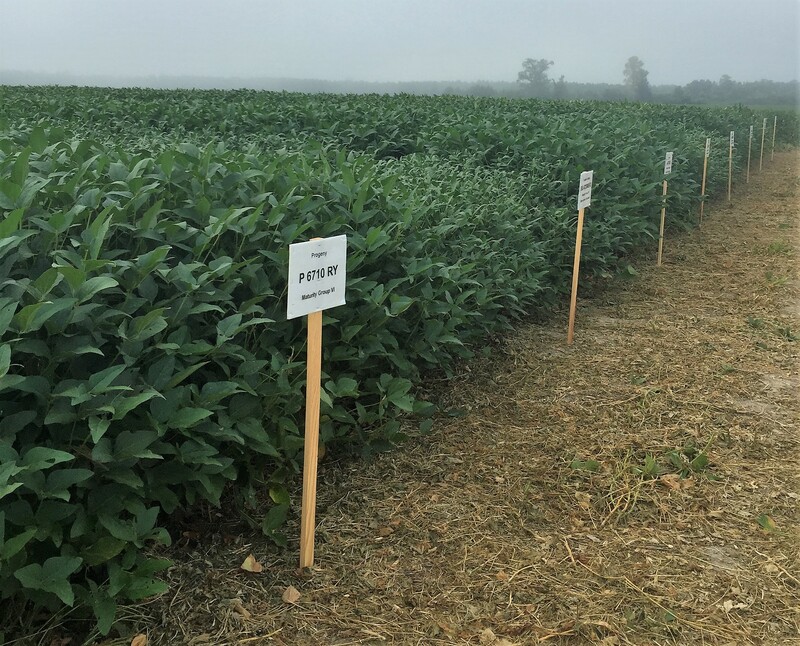 While no single soybean variety can provide complete protection against all the diseases that may occur, knowing the history of disease in a particular field will help select a variety with the most appropriate disease resistance package. 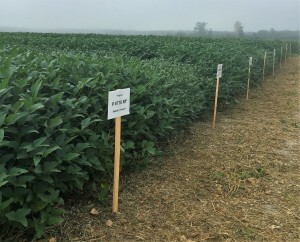 Fields with a history of disease are likely to have those diseases again; therefore, resistant soybean varieties should be chosen for those fields. 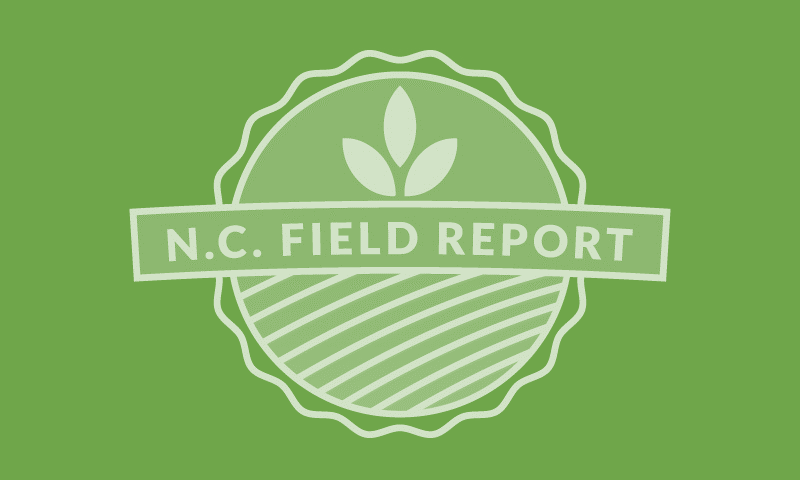 Common diseases occurring in North Carolina for which genetic resistant varieties are available include frogeye leaf spot (FLS), sudden death syndrome (SDS), and stem canker (SC). Information on which varieties possess resistance to which of these three diseases is available in the variety selection tool. In addition, the disease resistance package of a variety is available from your seed dealer. Nematodes are pests that can also cause significant yield losses to North Carolina soybean growers. Soybean cyst nematode (SCN) is likely the most serious disease problem in North Carolina and is found in fields across the state. Other common nematodes, such as root knot nematode, can also significantly reduce producers’ yields. Many varieties possess resistance to some nematodes, and that information is available from your seed dealer or the variety selection tool. Finally, once you have narrowed down the list of varieties, yield can be considered. Yield potential is probably the most important factor when selecting soybean varieties. Selecting a variety that is high yielding is important, but yield stability across multiple locations and years is an even more important consideration. 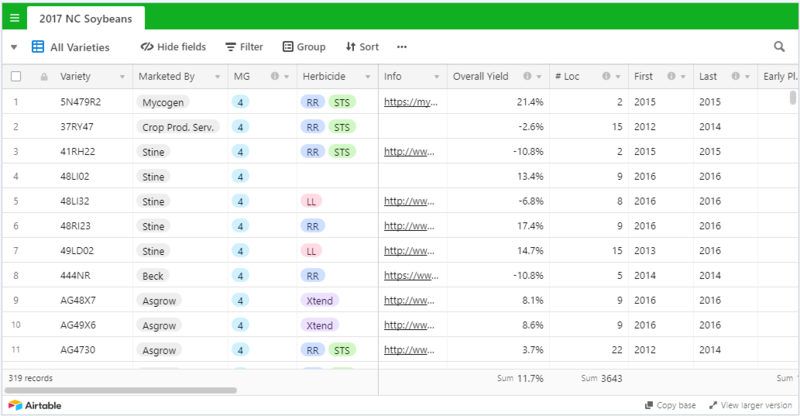 Yield potential is highly sensitive to environmental conditions, so multi-year, multi-location data will provide the most accurate indications of a given variety’s “true” performance. It is a natural tendency to want relative yield data from close to home, on similar soils, and with similar weather. Since there’s no way to forecast next year’s weather, the more environments the data encompass, the better. Next year’s yield in county X is better predicted by the state-wide averages from last year than by the county X results from last year. To provide unbiased, sound estimates of soybean variety yield, NC State conducts official variety testing (OVT) each year and compiles this information in the variety selection tool. This is a valuable source of multi-environment data that can be used to aid in variety selection. If you still have more than one variety on your list of possibilities after considering the above characteristics, consider price. Seed is a significant expense, but there is a limited range of prices among varieties. If two varieties differ enough in yield that you can tell the difference, the yield difference probably contributes more to profits than seed price does. Some varieties shatter more readily than others, but this is not nearly as big a problem as it used to be. It might still be worth considering if you anticipate that harvest may be very late (for example, after Thanksgiving) or if you are planting an earlier maturating variety. 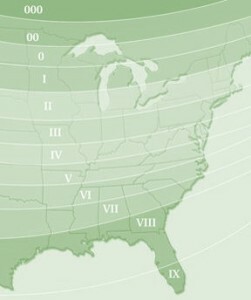 Some varieties lodge (fall down) more readily than others, especially at higher populations. It makes more sense to reduce the population with these varieties than to refuse to use them. Some varieties grow taller than others, but unless the soybeans are being grown for forage, this trait is of little consequence. It seems logical that relative height would be a useful characteristic for double-crop situations, but examining which varieties yield relatively higher with late planting dates is probably a more useful approach. Within the range of seed sizes that seedsmen are willing to put on the market, seed size is of almost no consequence. Larger seed require more energy to pull the larger seed out of the soil, but it has more energy in the larger seed to tackle the greater task. Flower color (purple or white), pubescence color (gray or brown [“tawny”]), hilum color (black, brown, buff, or variable), and pod wall color (tan, brown, or black) appear to be of no consequence in how a variety performs. While you may have a personal preference, these should not factor into your decision for selecting the most appropriate varieties for your farm. The key to determining the best variety for a field depends upon individual production systems. Before selecting a variety, you must understand the type of variety needed to maximize yield. Recording information about each field allows you to understand its history related to pests and pathogens and what specific needs it has. This will allow you to select the best variety for each environment. NC State University OVT data can be obtained at here and the NCSPA Soybean Variety Selector Database Tool can be found here. In addition, seed dealers can provide further information about varieties. Spending time and effort reviewing these resources to select the right variety is a smart investment.